The current technologies behind digital transformation, such as artificial intelligence, virtual and augmented reality, blockchain, Iot, robotics and big data, have a great impact in organizations and its leaders. The program Digital Transformation delves into these technologies, addressing the challenges and opportunities that arise with them. Additionally, participants will gain tools to navigate the digital landscape in innovation and leadership sessions that will prepare them to conquer the digital disruption wave. In a blended format combining online with face-to-face experience, this program is a collaboration initiative between Aalto EE and Insper Executive Education. The program duration is 32 hours face-to-face and 16 hours of online modules. Is a company wholly owned by Aalto University, providing executive education, professional development and training with three brands that have strong links to the Aalto Community: Aalto EE, Aalto PRO and Aalto ENT. Aalto University brings to our offering a multidisciplinary approach, together with innovative learning methods; this provides a unique combination of practical expertise and latest research. To understand the technologies that are transforming the business landscape. To propose changes and innovations in a structured way. To prepare yourself to lead changes in the organization. The program is aimed at business managers and entrepreneurs that need to respond to rapidly changing business environment, specifically by adapting their business to incorporate digital business solutions and new technologies. This program requires degree and an advanced level of English language for listening comprehension, speaking and reading. PhD from the Université de Pau et des Pays de L’Adour, France (thesis in the area of ​​international management). Master in Business Administration from the Presbiteriano Mackenzie Institute and the Université de Pau et des Pays de L’Adour, France (dissertation in the management area). International Executive MBA from FIA – USP. She holds a postgraduate degree in Marketing from EAESP – FGV and a degree in Psychology from the University of São Paulo (USP). Career in Human Resources, having worked in several national and multinational companies in Brazil, Latin America and Europe, focusing on the areas of Leadership Development and Organizational Change. Author / co-author of books in the areas of leadership, international management and corporate education. Since 2006 she has also worked as a teacher in Executive Education programs and MBAs, with courses at Mackenzie, FEI, FIA and FGV Management. In July 2014, she moved permanently from corporate life to academic activity, becoming an adjunct professor – exclusive dedication to Insper, in undergraduate and executive education programs. He has been Professor and Researcher at Insper since 2002. He was Executive MBA Coordinator between 2003 and 2005 and Coordinator of the 2008 Graduation Course, a professor of e 2009. 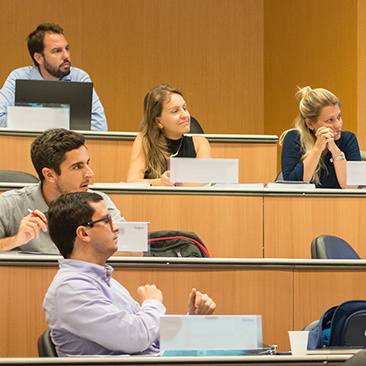 In the Master, MBA and Undergraduate courses in Operations Management and Chain Strategy of Supplies. As a researcher, he has been working in the areas of Operations Management, Supply Chain Management, Quality Management and Operations Strategy for manufacturing companies as a service. Production Engineer from the Federal University of São Carlos with a master’s degree and PhD in Business Administration from FGV-EAESP. He attended specialization courses at Washington University and Harvard Business School. He worked as an executive in national and multinational companies with consulting and training in the areas of performance, processes, quality and management of companies such as Votorantim, Itaú, Santander, Bradesco, Cielo, Ambev, Gerdau, Bayer, Roche and Brasken. Subject to change without prior notice, depending on the number of participants. Entraremos em contato quando uma nova turma abrir.